Although I will be the first to admit I am not a tree hugger, I also believe that we should be wise with our finances and take care of the world around us. 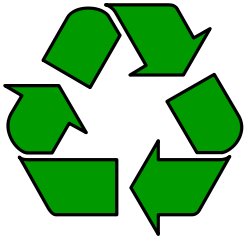 There are many things we can do to minimize waste in the office. Printed extra sheets that you didn't need? How about cutting them up for note paper or, if it isn't confidential information, go ahead and donate it to schools or Sunday school for scratch, project or coloring paper. Keep it for fire starters or shred it and use it for pet nesting material or package packing material. Read the document on your screen but check the "Print Preview" and make sure you are only printing the pages you need if you absolutely must print the item. Don't have any paper around? Don't buy it. Use one of the free "sticky note" programs and add it to your computer desktop instead of using paper. It can't blow away and is locked away when you lock your computer for the evening. Take your empty printer cartridges to Staples and get $2.00 per cartridge added to your Staples Rewards account.